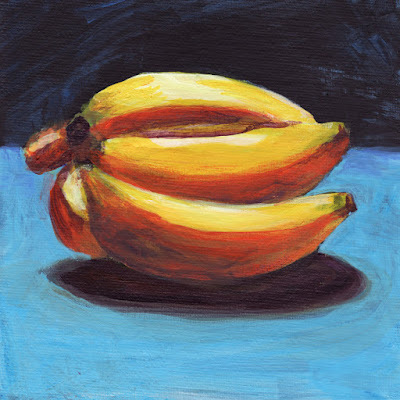 diana lynn's painting a day: Bananas. For years, one of my Dad's favorite sayings is that he is so old, he no longer buys green bananas. Makes me laugh every time. This painting is another acrylic lesson and I am beginning to better understand the medium. This bunch of not-so-green bananas from a distance is shockingly vivid. I rather like it: from a distance.